This sleek Rechargeable Bluetooth Notebook Mouse is your "go to mouse" for desktop and mobile computing situations. Its compact case design and advanced Blue-optical sensor technology deliver enhanced performance over a wide variety of surfaces. 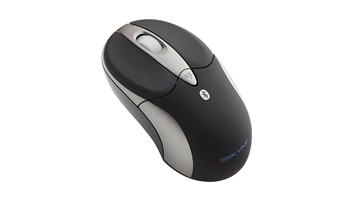 Connecting via Bluetooth technology, the Rechargeable Bluetooth Notebook Mouse delivers an uninterrupted 33 foot (10 meter) wireless range. It’s rechargeable via included USB cable so dead batteries are never an issue. Designed for both Windows PC and Mac OS X computers, the Rechargeable Bluetooth Notebook Mouse is the perfect choice for desktop, coffee shop, airport and hotel room computing. Overall Dimensions: 8.4" x 6" x 2.6"